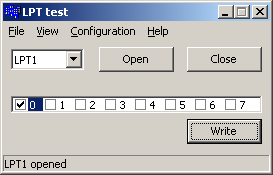 Applications running under Windows 2000 or XP could not access system hardware directly. This is quite reasonable - see Dr Dobbs, Direct Port I/O and Windows NT article. PortTalk - another library with liberal license. 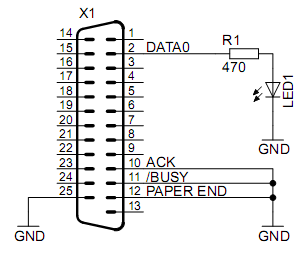 For simple purposes such as driving few relays or LEDs using custom library may be not needed. By tying few handshake port lines to the ground we can trick operating system and toggle data lines using standard CreateFile/WriteFile API. 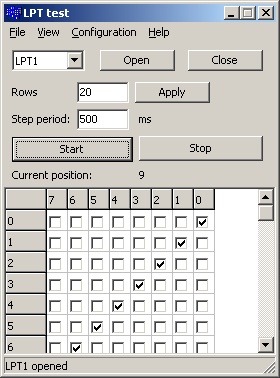 Simple program to set/clear data lines (with source code, Turbo C++ 2006 aka C++ Builder): LPT_test.7z. has a minimum value of 2000 (2 seconds) on WinXP. Default value is set to 300000 (5 mins). Another interesting article - How To Connect a USB TO IEEE 1284 Parallel Printer Cable To Visual Studio shows how to write data directly to USB generic printer adapter. This may be very cheap (I've seen those LPT-USB adapters under $2) solution to add few generic TTL output lines to PC. WSED.zip: another application, intended to control 4-motor electric model using keyboard/mouse and LPT port. 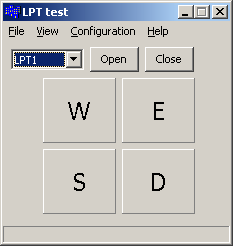 LPT_pattern.7z: yet another application that generates signal patterns with LPT port.